I turned the corner and paused. This looked familiar. I studied the black and white snapshot. It was a photo of Higo Variety Store. Raised in Seattle, I knew that this store was a landmark. In 1991, when I worked at the International Examiner, the editor bought candy from Higo. “How old are these Lemon Drops?” I put the mothball smelling package under his nose. Higo had been around for so long that the children’s hapi coats in the display window were faded. “Orientals” shopped there before the term “Asian American” was coined. Higo was run by two sisters who were around my grandparents age. It was a Japanese American-owned ten cent store from a past era. Born to Filipino-Chinese immigrant parents, I was never brought to Higo. We had our own dives, like Beacon Market where I held my breath and tugged on my parents clothes because the stench of the pig blood coagulating on the linoleum floors was too old-country for my Safeway sensibilities. 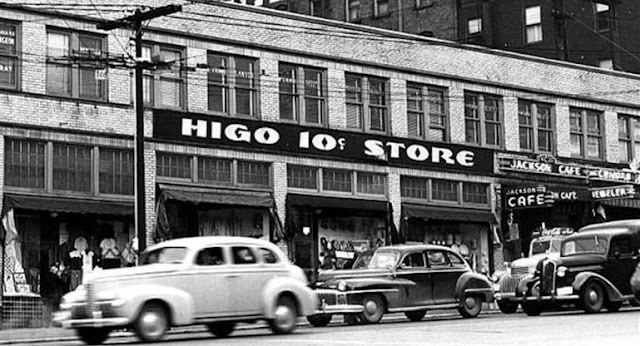 Higo, Beacon Market, and the restaurants in the International District were all old to me. In the early 1990s, the International District had no shiny bubble-tea cafes. The Vietnamese restaurants had bars on their windows and rumor has it that Asian gangs prowled about at night. Built at Sixth Avenue and South Jackson Street in 1932, Higo Variety Store was in the heart of the ‘hood. Its large glass window panes reflected the flashing police lights at night. These windows partially reflected my round face as I peered into the store. I had only set foot into Higo a few times. Mostly to be transported back in time. Turning the corner in the Executive Order 9066 exhibition, it was that photo of Higo’s windows boarded up when Japanese Americans were incarcerated during World War II, that shook my body and caused me to pause. It was as if all the humiliation I had at being Asian—the small clothes and stinky food, the Karate Kid headband and funny shoes that were sold at Higo—was now officially covered from view and locked away. I wanted them back. I wanted the windows and doors open. I wanted to claim the initial source of my embarrassment and shout out my working class Asian American pride. A newspaper blew up the sidewalk in this desolate photo. I felt empty, ordinary, and lost. More than half of Seattle’s Japanese American businesses never reopened after World War II. Nihonmachi disappeared. Higo was a curiosity. I wouldn’t have felt so strongly about the photograph if I hadn’t secretly wanted to board up the parts of the store that caused me shame. The difference with the 1942 snapshot was that I had no choice. 30 years before I was born, the president of the United States ordered people of Japanese ancestry to relocate and Higo to close. When Kobo moved into Higo in 2004, I wasn’t sure how I felt. Kobo had a store on Capitol Hill across from the Harvard Exit that showcased Northwest and Japanese arts and crafts. I always felt calm and comfortable in the store even if I couldn’t afford the merchandise. How would design-savvy Kobo change old-fashioned Higo? How would this new version of Asian American as hip cover the reality of racism and poverty for certain Asians in America? Was Kobo at Higo part of the market-rate condominium and fancy restaurant gentrification of the International District? I went to visit. Half the store was in a disarray with covered glass cases from the 1930s, chipped floor tiles, and small wooden crates scattered about. True to its name, this part of Kobo remained an “artist’s workspace.” I realized that the confluence between contemporary retail gallery and historic raw space would provide the perfect location to investigate how Asian objects become displayed. During my month-long performance residency called Display, I will occupy this transitory space of Kobo at Higo during store hours to embody what it means to be on display. I will interact with the space by displaying myself for customers and passerby’s as a live East Asian performer. More than a street performance, Display is an opportunity to study myself as artifact and artisan, consumer and consumed in an Asian American retail space. In addition, this residency will feed my work-in-progress prompted by the experience of the undocumented Chinese immigrant who was trapped in the Bronx elevator for three days. In the elevator, he is free from the gaze of Americans. To understand this feeling of contained refuge, I must subject myself to its opposite: voluntary display. As a generative musician, I rely on the interaction between all my senses to create works that remember then imagine. 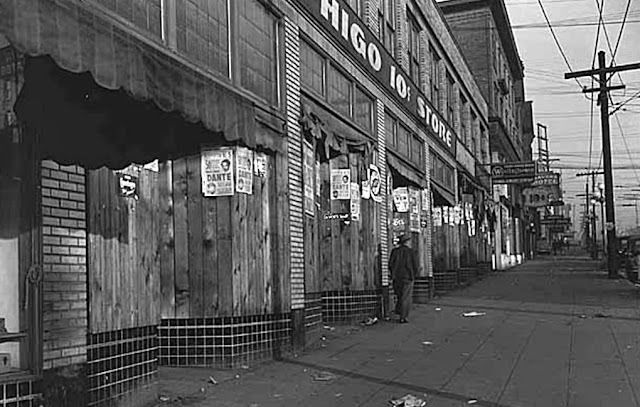 Inspired by the 1942 photograph, I know that I must find ways to tell about the experiences that encourage justice, otherwise these stories, like the 1942 windows of Higo, may be boarded up by powers beyond my control, then forgotten. The fact and fiction I can explore while literally on display may uncover multilayered truths about Asian American representation. My findings from Display will culminate in a public performance in Kobo at Higo as well as documentation of the project.